So I already have a go-to granola but I always love trying new ones and, since I’ve been having this recent love affair with Heidi’s book, I figured that while I’m at it, I should probably try her granola, too. Every recipe I have made from this book has been a winner and this one is no different. Of course, I had to make sure the oats were gluten free (thank you, Bob’s Red Mill), but from there on out there were no substitutions or exceptions to be made. 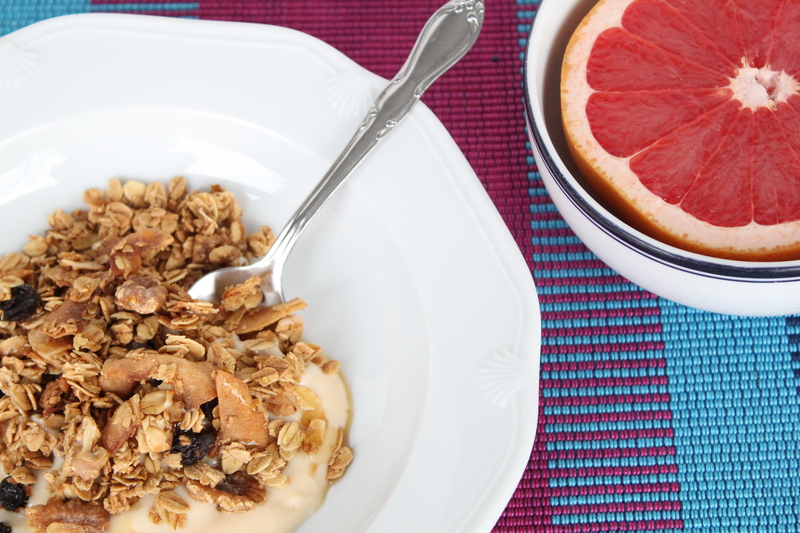 Served atop peach soy yogurt, drizzled with a little bit of pure maple syrup, alongside a deliciously, juicy pink grapefruit, this was the perfect breakfast to ring in the first weekend of the new year. recipe notes: I really love the subtle orange flavor that comes from the orange zest. Heidi’s recipe calls for the zest of two oranges but I was worried it would be over-powering so I only used a half. I like it this way, but I’m sure it would be good with more, as well. I plan to experiment in the future. The wet to dry ingredient ratio is excellent and I didn’t feel like it needed to be any sweeter, but if you like you can always use more butter or maple syrup. I did greatly enjoy drizzling my individual serving with maple syrup, as mentioned above. The one big difference between this and my standard granola is that the raisins are baked with the granola, as opposed to tossed in after. The baked raisins plump up in the oven, soak of the maple/butter flavor and turn out to be actually a little crunchy after cooked. There have been a few that I have questioned might have gotten burned through the process, but as a whole, I do enjoy the crunchy raisins. It’s totally a personal preference should you choose to bake them or toss them in after and I actually think I don’t really even have one. Finally, the other different between this recipe and my go-to is that this calls for the granola to be spread out on two baking sheets which I definitely prefer as it becomes a little crunchier and you are less at risk of having clumps that don’t dry out enough while baking. 1. Preheat the oven to 300 degrees F with racks in the top and bottom thirds of the oven. Set out two rimmed baking sheets. 2. Combine the oats, walnuts, coconut, salt, nutmeg, raisins, and orange zest in a lage mixing bowl. Heat the butter in a small saucepan over low heat and stir in the maple syrup. Which until thoroughly combined, then pour the maple mixture over the oat mixture and stir until everything is well coated, at least 30 seconds. Divide the mixture equally between the two baking sheets and spread into a thin layer. 3. 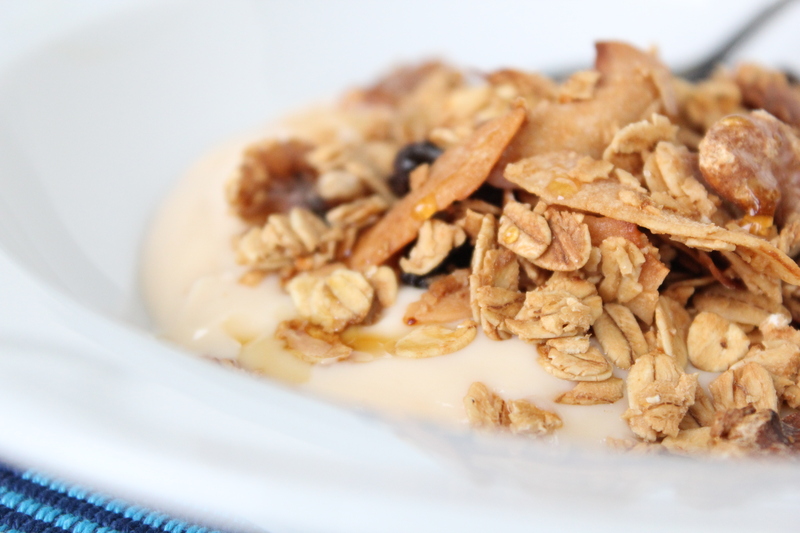 Bake, stirring a couple times along the way, for 40-50 minutes, or until the granola is toasty and deeply golden. I also rotate the pans a couple times to ensure even baking. 4. Remove from the oven. 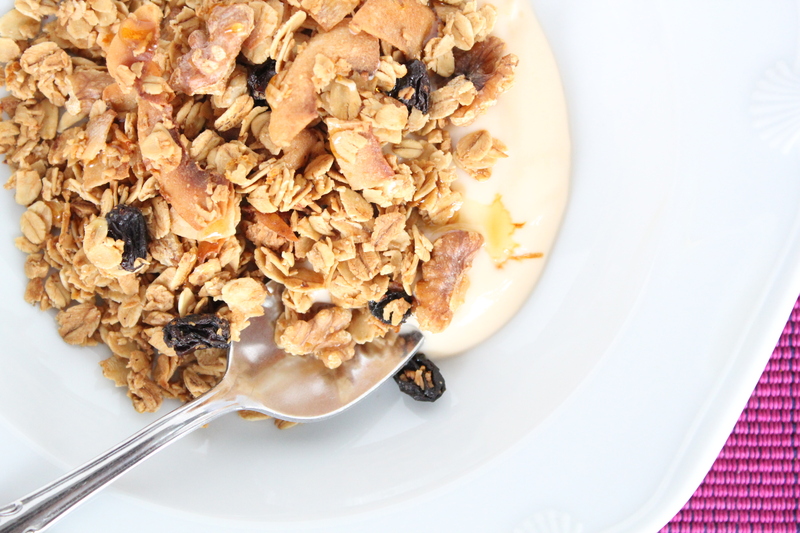 If you like clumpier granola, press down on it with a spatula. Let cool completely, then break apart and store in an airtight container at room temperature.